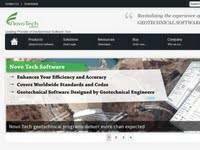 Novo Tech Software is the developer of 11 civil engineering softwares currently listed at CESDb. Please visit developers website for software support, product updates, licenses and other information about NovoLiq, NovoSPT, LateralK, NovoFormula, VisLog, NovoCPT. LateralK is a simple software for calculating lateral earth pressure coefficients and forces behind retaining walls in static and earthquake condition based on Rankine/ Coulumb formulas and also Mononobe/ Okabe methods.